Stop by the Ely Stage Stop & Country Museum for some old time American fiddle music on Sunday, July 5. The place willl be decked out in red, white, and blue and the musicians promise to add some patriotic tunes to the round robin jam session. Musicians will play in the Ely barn from noon until 2 p.m.
Come early to picnic and check out the latest museum acquisitions and displays. In the main house you can tip your hat to a newly loaned display of ladies’ Victorian Era hats, hat boxes, and hat pins, complements of Barbara White, local specialist in period clothing. You can also still enjoy the Lake County Dairy History display in case you haven’t caught that one yet. 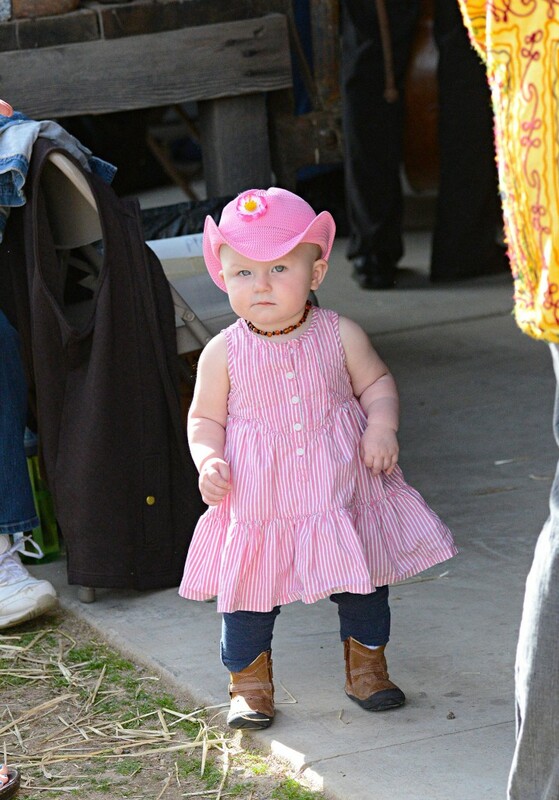 This free, family friendly event can be enjoyed by all, young and old alike. Enjoy the music with beverages and tasty treats provided by the docents. Bring your own wine and sip it in Ely Stage Stop wine glasses that are available for purchase. Up for heartier fare? This Sunday local Pogo’s Pizza will be on site offering pizza, burgers, hotdogs, and beer for purchase. There will be the regular monthly raffle near the end of the jam and more chances to purchase raffle tickets for the “Barns, Birds and Quilts” raffle that will celebrate a winner later in the year. Those items will be on display in the barn during the jam. Home to the Lake County Historical Society, the stage stop is located at 9921 State Hwy 281 (Soda Bay Road) in Kelseyville, near Clearlake Riviera, just north of Hwy 29-Kit’s Corner. Current hours of operation are 11 a.m. to 3 p.m. each Saturday and Sunday. Fiddlers’ Jams occur the first Sunday of every month from noon until 2 p.m. The August jam will take place on August 2nd. Living History events featuring local historians are held on the fourth Saturday of every month, again, from noon to 2 p.m. Catch the next one on July 25th. Saturday, June 27, affords the next opportunity for the public to enjoy Lake County history as the Ely Stage Stop & Country Museum continues the series of Living History events from noon to 2 p.m. This particular event will welcome historian Bob Prather whose specialties include Adams Springs and the Loch Lomond area. Prather will be available to the public in the Ely main house starting at noon to visit with guests and answer questions. Conversations with Prather may highlight aspects of the book, “It’s Lonely at the Top”, written by David J. Morgan. The book deals with narrow gauge logging in Lake County. Prather’s uncle, W.W. Prather, and his lumber company are featured in the book. Guests can find copies of the book for purchase at the Stage Stop main house along with other books on Lake County History. Home to the Lake County Historical Society, the stage stop is located at 9921 State Hwy 281 (Soda Bay Road) in Kelseyville, near Clearlake Riviera, just north of Hwy 29-Kit’s Corner. Current hours of operation are 11:00 a.m. to 3:00 p.m. each Saturday and Sunday. Living history events are held on the fourth Saturday of each month. Fiddlers’ Jams occur the first Sunday of every month, again, from noon until 2 p.m.
As the first barn was nearing completion at the Ely Stage Stop & Country Museum, it became clear that the museum would be much more than simply a place for the public to enjoy its wonderful displays and historical artifacts. Lake County has a bounty of talented musicians and dreams were being fulfilled that would celebrate these local musicians and the American music heritage from the Ely Stage Stop Victorian Era. 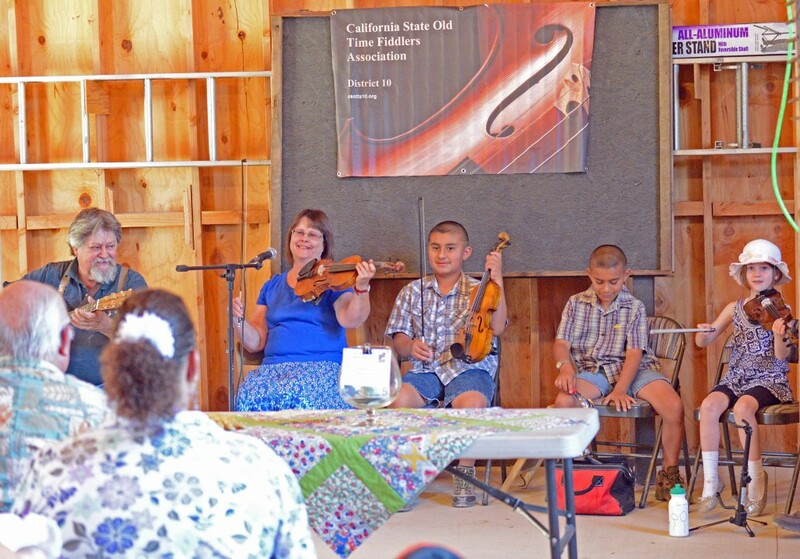 Don Coffin contacted Greg Dills, Ely Stage Stop Director, in 2013 looking for a place for the California Old Time Fiddlers’ Association’s District 10 to play. District 10 serves Sonoma, Lake and Mendocino counties. Coffin attended a docent meeting and when asked if his group would be interested in meeting at the stage stop to jam sometime, he gave an enthusiastic positive response. A decision was made on the spot and the dialogue moved to firming up a plan. The porch and/or barn were offered, the first Sunday of the month was chosen and, as we like to say at the museum, the rest is history. 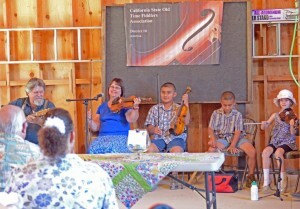 The mission of District 10 of the California Old time Fiddlers’ Association, cited on the website http://carneyscorner.com/csotfa.html, is “to promote an interest in the old time American fiddle styles and to create more opportunities for interested parties to learn about the lineage of fiddle music in America, to promote activities related to old time fiddling (jams and concerts, and contests), to foster a sense of community in this shared musical treasure, and to preserve a truly American art form.” The Ely Stage Stop has proven to be the perfect venue to foster the Association’s mission and to get our local community involved. The Fiddlers’ Jam runs at the museum on the first Sunday of each month from noon through 2 p.m. The next jam is this Sunday, June 7. Musicians of all ages with all sorts of instruments will descend upon the barn for the round robin style jam session. Come early to picnic and check out the latest museum acquisitions and displays. This free, family friendly event can be enjoyed by all, young and old alike. Enjoy the music with beverages and tasty treats. Bring your own wine and sip it in Ely Stage Stop wine glasses that are available for purchase. Come ready to clap your hands, tap your toes or get up and dance! There will be the regular monthly raffle near the end of the jam and more chances to purchase raffle tickets for the “Barns, Birds and Quilts” raffle that will celebrate a winner later in the year. Those items will be on display during the jam. Remaining tickets to Ely’s June 13 Picnic on the Porch fundraiser can also be purchased during the day.